Knopper galls on our traditional English oak, Quercus robur, are caused by a minute gall wasp, Andricus quercuscalicis. The insect is a relative newcomer to Britain, the first recorded sighting being in 1962. It appears to have arrived naturally from the continent and rapidly spread across England and Wales. In 1979 it underwent a population explosion and for a time there was real concern that it would seriously affect the acorn fertility and thus the future of our most iconic tree. Like most gall wasps, the life cycle is complicated, with an alternation of a sexual and asexual generation each year. 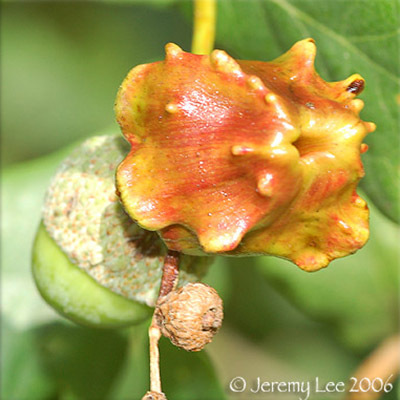 Only females emerge from the knopper galls and these lay their eggs in the buds of the Turkey Oak, Quercus cerris. In the spring this sexual generation causes minute galls in the male catkins. And why "knopper" gall? The Oxford English Dictionary defines a 'knop' as "a small rounded protuberance, boss, stud, button, tassel or the like".